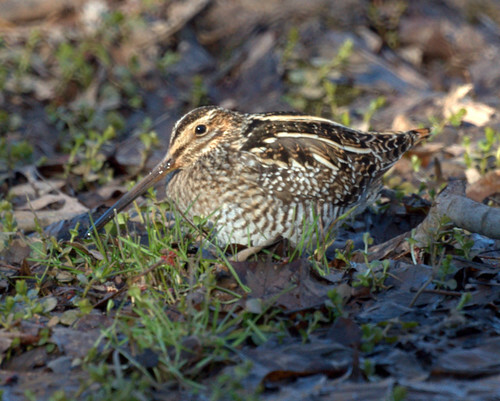 A wilson's snipe has been reported in Johnson Park in Piscataway for the past week on the JerseyBirds email list. So, off we went this evening in search of the snipe. Chris found it first and was eventually able to explain to Mike where it was so he could get a few photos. i just saw one in New Brunswick, NJ, over on the Theological Seminary property. I wasn't able to get a photo, but was able to identify it because of yours. Thanks! It was so cool! Such a cutie and remained quite close to me. I was surprised and wondered even if it might have a nest there because I was shocked at how close it stayed to me but it was certainly keeping a very close eye on me!